is for players of all levels ages 7-9. Campers will be evaluated on the first day of camp and grouped according to their age and skill level. The Classic Skill Camp format dedicates the morning session to working on basic skills and soccer concepts, and the afternoon to teamwork and games. Game situations are created that will allow campers to improve their skills while having a lot of fun! Our coaches are well trained and will provide a camp that is fun and challenging at every level of play. To ensure proper training our coach to player ratio is 1: 10 or less. 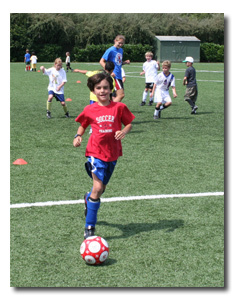 Classic Skill Soccer Camps are for players of all levels ages 7-9. Campers will be evaluated on the first day of camp and grouped according to their age and skill level. The Classic Skill Camp format dedicates the morning session to working on basic skills and soccer concepts, and the afternoon to teamwork and games. Game situations are created that will allow campers to improve their skills while having a lot of fun! of soccer; passing, dribbling, shooting, trapping etc.